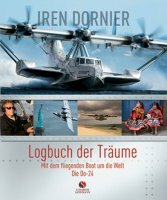 The Logbuch der Träume (Book of Dreams), currently in German version, is a 256-page coffee table book about the Do 24ATT world tour. The book features photos of the magnificent destinations, landmarks, and people who made the world tour possible. Written by Capt. Iren Dornier himself, and co-authored by Susanne Fischer.